After nine years and a journey of 3 billion miles (4.8 billion km), Nasa’s New Horizons robotic probe awoke from hibernation on Saturday to begin an unprecedented mission to study the icy dwarf planet Pluto and sibling worlds in its Kuiper Belt home. A pre-set alarm clock roused New Horizons from its electronic slumber at 3 pm EST (2000 GMT), though ground control teams didn’t receive confirmation until just after 9:30 pm (0230 GMT on Sunday). New Horizons is now so far away that radio signals traveling at the speed of light take four hours and 25 minutes to reach Earth. The scientific observation of Pluto, its entourage of moons and other bodies in the solar system’s frozen backyard begins on January 15, programme managers said. The closest approach is expected on July 14. 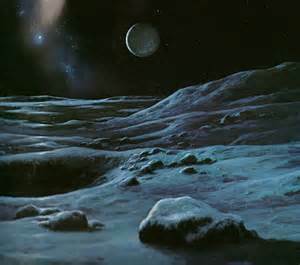 Pluto lies in the Kuiper Belt, a region of icy mini-planets orbiting the sun beyond Neptune that are believed to be leftover remains from the formation of the solar system some 4.6 billion years ago.It is the last unexplored region of the solar system. “It’s hard to underestimate the evolution that’s taking place in our view of the architecture and content of our solar system as a result of the discovery … of the Kuip er Belt,“ lead researcher Alan Stern said. Since its discovery in 1930, Pluto has been a mystery. Scientists struggled to explain why a planet with a radius of just 740 miles (1,190km) -about half the width of the United States -could come to exist beyond the giant worlds of Jupiter, Saturn, Uranus, and Neptune. “We wondered why Pluto was a misfit,“ Stern said. In 1992, astronomers discovered that Pluto, located about 40 times farther away from the sun than Earth, was not alone in the far reaches of the solar system, prompting the International Astronomical Union to reconsider its definition of “planet“. In 2006, with New Horizons already on its way, Pluto was stripped of its title as the ninth planet in the solar system and became a dwarf planet, of which more than 1,000 have since been discovered in the Kuiper belt. With New Horizons approaching Pluto’s doorstep, scientists are eager for their first close-up look at this unexplored domain.